This piece is based on drawings of the bedding planes of cliffs in Winspit, Dorset. 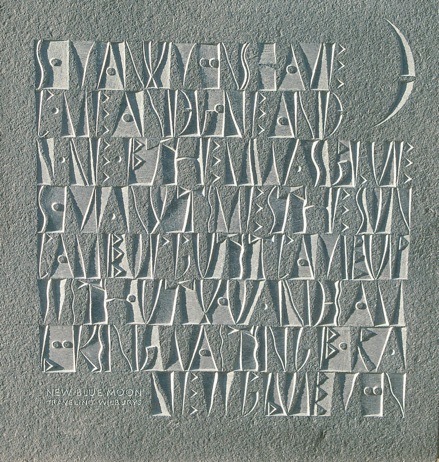 A song by the Traveling Wilburys, New Blue Moon, was very poignant to us at the time and the sketch turned into lettering, reflecting an organic texture whilst the words are carved at different angles which between them suggest the bedding planes and excrescenses of the cliff face. Text: Traveling Wilburys ‘I am waiting for a new blue moon'. Burlington grey flametextured Slate 625x595x20mm 2002.